The Wandering Wyvern: Sparkle - 2018 - a South West Girls Adventure ! With the grace of my work rotation falling just right, I was able to attend the wonderful sparkle event again this year, having had a couple of years off. I had arranged to travel up with some friends from the south west and was really looking forward to having some time to catch up and chat. Sadly Jemma and Hanna were not able to come this year leaving just the four of us to take Manchester by storm! My day started well with me waking up early and having a shower and getting dressed for the journey. I had bought a new summer outfit for the trip, with a cool blue and white stripy top and white cotton trousers – very ‘beachy’ said my partner peaking out from under the covers when she woke up. Getting my make up oncaused the first of the days disasters as my foundation sprayed over my new pristine white trousers and wouldn’t wash out ! The day was off to a good start! I loaded my Landover with all my various bags of clothes shoes and assorted items, as well as my work bag and umbrellas, rain coat, sun block, and hat! - I even considered taking my winter fleece just incase as the weather had been so hot for so long .. it was Manchester and we needed to be prepared for anything. I was away from home by 7:30 am aiming to reach Nicky’s house in Somerset by the appointed 10am, and settled into the journey. This was going to be my eighth Sparkle that I had attended and was hoping for good things from the event and weekend. Getting close to Taunton on the M5, I pulled onto the slip road and found that I had no pressure on my clutch peddle and it went right down to the floor with no response! I was eventually able to engage first gear and move to somewhere safe to park. I realised that I would be able to make my way to Nickys house if I kept pumping the clutch peddle and then make a plan from there. So after a tense 20 mile drive along narrow, twisty, hilly country roads, I arrived safely at Nicky’s house on time. The original plan was for me to transport Sophie, (one of the new south west girls who has recently come out,) and follow Nicky and Ginny up to Manchester, however that was now in some doubt as my Defender was probably not going to make it. A call to the Landover assistance service saw an engineer on his way to assess the vehicle, so we thought it best that Nicky and Ginny go ahead and we would keep them informed of any developments. The borrowed and the broken! The engineer arrived about two hours later and was very professional in dealing with my problem. He concluded that the hydraulic system had failed and could not be repaired in less than a day. However as I has bought my Landover from a main dealers it had a warrantee and included the use of a courtesy car. So we arranged to drive off to the main dealers in convoy with the engineer leading the way incase I had a total failure and needed towing to the garage. On arrival the slow process of assessing the Defender and arranging for a courtesy car dragged on until after six pm, which was a little baptism of fire for poor Sophie, as not only was this one of her first times dressed out in public, the security team at the main dealers used to work in the same area as she did in London in the past and they had a lot of common friends! We were eventually able to leave and make our way north and made a quick call to Ginny confirmed that they had arrived safely and had informed the hotel that we were on our way. Luckily as we were later than expected the roads were reasonably quiet and the brand new top of the range discovery sport ate up the miles and we arrived at the hotel about four hours later. A quick drop off of the bags into the hotel rooms and freshen up then we walked into canal street to meet up with the others. Even though it was now well after 10pm, the temperature was still warm and balmy, so a lot of people were sitting out in the street, giving Sophie her first glimpse of what was to come. 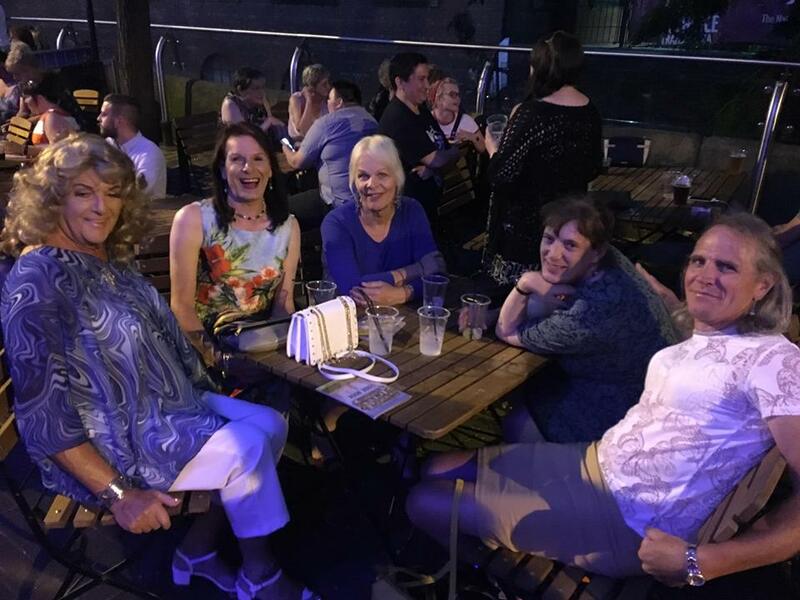 Knowing Nicky and Ginny, we found the first bar playing high energy 80’s dance music and went in … bingo – there they were dancing for all their worth on a crowed floor in the first club we selected! After getting to bed at about 1am we arranged to meet at 9 in the morning and go for breakfast in our usual little café next to the Arundel Centre in the middle of the town. The staff at the café have had a few years to get to know us and always give us a great welcome and lots of banter, so we have become honorary regulars. We had our breakfasts here every morning and the staff were always interested on what was going on each day in the park. I had gone for a long white and purple summer dress that was both cool and stylish as the weather was still exceptionally warm for the UK, this was paired with some low black ballet slippers making pavement pounding comfortable. After our breakfast we hit the town and check out the shopping areas. I found an area that was able to sort my eyebrows out and they performed their magic with threading. I don’t know about you, but any pulling of my eyebrows results in me sneezing … every time, all the time .. and in the middle of a shopping center was no exception! - Sophie and Ginny tried to disown me as I made the windows rattle with my sneezing ! Eventually the job was done and my brows had been tamed into some semblance of tidy and looked fab! Next stop was the delights of Marks and Spencer’s, who were having one of their best sales that I have ever seen. I was on a little bit of a budget and had severe space restrictions in my wardrobe at home so had to restrain myself to just a couple of tee shirts and some rather fabulous wide legged cotton trousers, …which may also suit my partner too. One quick stop off in Primark for my partner to pick up a yellow belt that she requested and I was accosted by two of the shop assistants, asking if I wanted to book a free makeover that they offered for anyone attending the Sparkle weekend. I didn’t fancy the makeover myself but knew that Sophie would really enjoy the experience, so she booked up to have an appointment at midday on the Saturday. It was time to wander back to the hotel and make ourselves ready for dinner as we had booked a table in Pizza express, which is my favorite restaurant, next to the main park in the city. I had chosen to wear my lovely blue & red swing dress matched with comfortable red hushpuppy shoes so as we could enjoy the dancing later in the evening. After a lovely meal, we wandered back and hit Canal Street, finding a place to sit outside some of the bars and watch the world go by, chatting to old friends and admiring all the outfits being warn by the people attending sparkle. The street was beginning to get busy as more and more people arrived to make the most of the good weather and build up for the event. Several of the bars had regular drag acts on and the performers were out in the street enticing people in to enjoy the shows. We made our way to one of our favorite bars and danced the night away to a wide range of 80’s music – which was probably the most popular with all the patrons as the dance floor was never empty while they were playing ! On the Street with Caroline - an Honorary SW girl! This year the park had been laid out with meticulous planning. The stage was set up with lights and sound system, a row of portaloos were on site, a big bar tent and a vip tent erected in prominent positions, and the host of vendors areas arranged in a winding route to allow easy access. Security had been stepped up and the whole thing gave an air of a professional and well managed event. The stage was set to give nonstop entertainment all day and well into the evening, with a host of acts, starting off with a local 100 voice rock choir who got the party rolling with their renditions of modern and classic rock songs sang with high energy and enthusiasm! Sparkle was making an effort to showcase the talent across all the trans community. Our Nicky was a singer songwriter and had entered into the talent contest for singing her original work, and was performing that day. We had all turned up to support her efforts, which coincided with England’s football game in the world cup quarter final! She sang three of her songs with guitar accompaniment, with great lyrics that reached out to all in the event. We thought that she did very well even though the sound engineer was obviously unfamiliar with the equipment and made some errors during the performance. However despite her best efforts, Nicky was nominated runner up in the event. Other acts of the day showcased drag kings, drag queens, trans groups and several trans singers, including the wonderful Jordan Gray, who was on a national television talent show a couple of years ago and has gone from strength to strength. Over the years Sparkle has provided numerous workshops on a wide range of subjects, some exclusively for the Transgender community others more general in nature. This year sadly there were very few over the weekend, however Ginny had found a workshop about the new Gender Recognition Act amendments that she was very interested in attending and came back with lots of information on how the act would work and the ramifications for the whole of the transgender community in the United Kingdom. I wont cover the act here as there is so much that is involved that I cannot do it justice in a couple of lines. Sophie and I made our way back to Primark where she had a wonderful time being made over by the team there. I spent some time chatting to the Area Manager of the store and she asked numerous questions about the transgender community, which I did my best to answer in an informed way. We discussed the success of the makeover initiative and how much it had meant to the girls who had received them. She and her team were so touched by the individual stories that each person had, how they felt being able to dress and be made over in the shop and how grateful they were of the results. The team who did the makeovers were considerate, sensitive and respectful, asking how their customers would like to be addressed before starting and offering positive support and tips to help them improve their make up technique. Sophie was really happy with her results and asked a lot of questions from the beautician, then bought some of the products used, so a ‘win-win’ situation. I suggested to the manager that this may be something that the store may seek to offer annually at their Manchester branch, and possibly have a similar service available for Trans people to book in other stores nationwide, and offer the same standards in a safe and sensitive environment. The weather for the weekend was truly wonderful, so much so we had to spend some time in the shade to keep cool and out of the sun! We had bought tickets for the VIP area, which was there for this purpose and we made good use of it during the day. By now it was getting late and we needed to get ready for our evening meal, so a quick pop back to the hotel and freshen up and change to hit the town for dinner. We had arranged to stay in an IBIS hotel on Charles street, which was about a four minute totter in heels to Canal street, and very central for the city. There was also cheap undercover parking very close by and the rooms were clean and simple. However we have noticed that the prices are creeping up each year and it is becoming increasingly expensive to stay there, so maybe we will find a more cost effective venue in the future. As the weather was still very warm, I chose to wear a lovely pale green and blue monsoon dress that my sister helped me choose from a charity shop, with matching bag and wedge shoes. The dress was mid calf and had small crystals embroidered on the bodice and fit very well. The park area in the town center was full of people relaxing and enjoying the warm weather, children were playing in the fountain. We sat outside eating another lovely pizza, however one of the waiters became a little flustered and mis-gendered one of our party, so Ginny went and had a little chat with him and he was most apologetic. Dinner in the sun - in Monsoon ! Back in canal street, and the whole street was full with hundreds of people eating, drinking and socialising as well as dancing in the clubs. We made our way to the famous New York New York show bar that had three separate areas, so as we could sit and chat, dance the night away or watch the Drag Queen DJ strut her stuff to the crowd. Like many of the venues over the Sparkle weekend, entry was free to members of the Trans community, and the dance floor showed how popular it was! From speaking to many of the vendors it seems that Sparkle is seen as the major event for Canal Street now as it is over several days and not a single or half day event such as pride. The sparkle goers tend to spend a large part of their weekend on the street and visit several establishments over a night, spreading their spending rather than staying in one location. Nicky and Myself in the Shade! The police enjoy the sparkle event too, as they say that there is very little trouble from the attendees, and most of the time they have the same issues as they would on any night in the city. This year we had some officers requesting to police the sparkle event and even had the Assistant Chief Constable of Greater Manchester spend a few hours in the park chatting to lots of attendees. The police had stalls and their rainbow police car on site to push home their visible diversity inclusion message. We danced and partied till late then made our way back to the hotel were we sat and chatted to some others staying there for a while before de-princessing for bed. After our usual morning routine of breakfast and meander round town and made our way back to the park. As is our custom on a Sparkle Sunday, we took a few minutes to visit the Transgender Memorial in the park, and paid our respects to one of our good friends, Steffi, who we sadly lost a few years ago, and remembered all the fun things we did together. I noticed that there were several other names added to the list and recognized a few. This was a somber reminder that we are not invincible and to enjoy life to the full. The stage was again in full swing and the fine weather continued with clear skies and high temperatures. Today saw more talent contests and the annual Miss and Mr Sparkle, and Golden Sparkle events that the talented Vicky Lee hosted in her normal relaxed and professional style. The park had an area set aside for the Mermaids charity, which supports children and young adults, and importantly their families when coming out as transgender. This is a very hard working group and is often quoted on national media and involved in guiding government bodies when dealing with children who are transgender. During the day I found the Marks and Spencer area where they had set up to provide advice on dressing style and offer bra fitting services . While I was chatting to the team one of the ladies disclosed to us that her daughter was born with an intersexed condition and all the struggles that she had in bringing her up. She had volunteered to work at the sparkle event as a way of supporting others as she had no support and knew nothing about the condition or options and managed to fight against all the barriers that were put in her way. She said her daughter was getting married the next week and how proud she was of her success. I mentioned to her about the Mermaids group and what they did, and later I found that she had been over to them and offered to be a support worker with the charity. All white on the night ! That evening we ate our last dinner in a fantastic Indian restaurant just outside the Gay Village, and it was one of the best meals I have had in a long time! It was full of Indian families who looked like they were visiting the area, and they all seemed to be enjoying the atmosphere. I had on my lovely white linen suit with my favorite Irregular Choice heels for the evening and had lots of nice comments about the outfit. Well - Its not Kansas any more ! After diner we hit the street for the last time ending up dancing to great music in Velvet where there was a team of drag queens taking turns to sing and dance and tell jokes as only drag queens can do, all in the best possible taste! It was after one am that saw me back in my room packing my bags in readiness for the return drive south in the morning. I loaded the car at about 8am and then waited for Sophie, saying good by to Nicky and Ginny at about 8:30. We eventually hit the road at 9am in the shinny discovery with Sophie and I discussing the weekend all the way home. Mainly about what she felt she had learnt, her feelings, emotions and how to manage her own ‘Pandora’ now that she was out of the box! The traffic was good and kept us moving and saw us safely back in Taunton about 4pm after a nice restful drive south negotiating the miles of road works en route, and in enough time to see my little defender sitting in the dealers car park still waiting to be fixed. Ho hum! I was a quick drop off of Sophie at Nicky’s and then back to return the borrowed car and start my way back north and off to work ! Many thanks to my fellow SW girls - Nicky, Ginny, and Sophie for a fabulous time; to all the organisers acts and volunteers in providing a great event again; and to my wonderful partner who encouraged me to have a fun weekend away with the girls! Laughter - the best medicine !